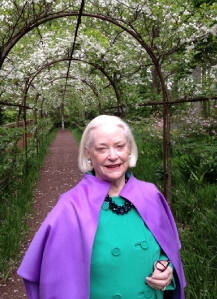 The Foundation for Landscape Studies is proud to confer its 2012 Place Maker Award on Elise du Pont in honor of her creation of Patterns, an estate landscape in Rockland, Delaware. Situated in a thousand-acre preserve overlooking the Brandywine River, in the same valley where the du Pont family began its long history in America, the home of Elise and Pierre S. “Pete” du Pont IV was designed in 1964 by architect Ike Colburn. Its modular modern design is replicated in the estate’s geometrically patterned gardens. These gardens form a series of vignettes – the hillside with its granite dining table, the temple ruins overhung with wisteria, the Dan Kiley-designed potager sheltered by a nine-foot holly hedge anchored by giant willows – set within a framework of three hundred-year-old oaks, beeches, and tulip poplars. Patterns is thus a fusion of art and nature, an example of place making in its highest form.